There's that old saying about March,,,and I must say it really does apply. This year March came in like a lamb and went out like a lion. These photos are proof! At the beginning of the month we had some nice comfortable teaser days but now that it's the end of the month, we've been waking up to temperatures in the teens. I'm just happy to see the buds on the trees and lilac bushes and the robins making their nests. I did go buy my vegetable seeds in preparation for the nice weather to come. I do love spring! 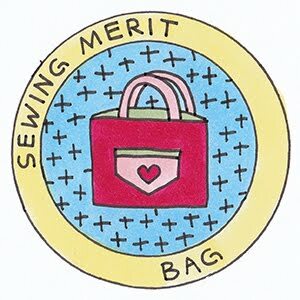 It seems that I've found a little niche from attending open sews. There are a group of wonderful ladies that like to make table runners and baby quilts but they are terrified of the quilting process. They do beautiful work and I would call them advanced beginners (if that makes any sense). So with that said, they love it when I do the free motion quilting on their projects. I do it cheaply because I just want the practice and they love how quickly they get their projects back. So I got this project yesterday and today I got it quilted. I am so happy to help and also appreciate the extra income. It pretty much pays for my quilt show "habit". There's always something worth buying from the vendors at those shows so it's nice to feel like I am not digging into the family budget for my fabric habit. All I can say is keep 'em coming, ladies! And thank you for letting me help you get your projects completed. Going to an open sew is a funny thing for me. I love hanging out with the ladies and we all share the projects that we're working on. Most of the women who attend take all the classes that are offered at the shop where we do the open sews. I do not take the classes so I don't share that experience. It seems that they all are finishing the projects that they started in the classes at the open sews. I, on the other had have to figure out what I'm going to work on while I am there. And I find that process a little stressful. Making sure I have everything I need packed and ready to go is hard enough. So I came up with a solution to my dilemma. 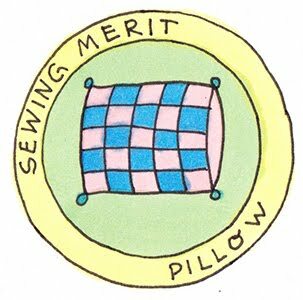 I've decided to do this one project only at my open sew sessions. 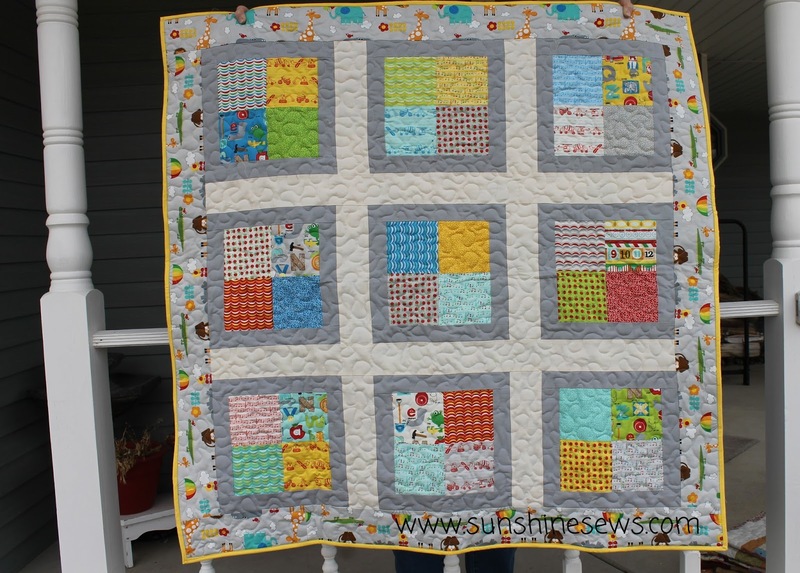 It uses a fabric line called Simplicity by 3 Sisters for Moda and a few other Moda fabrics that match nicely. 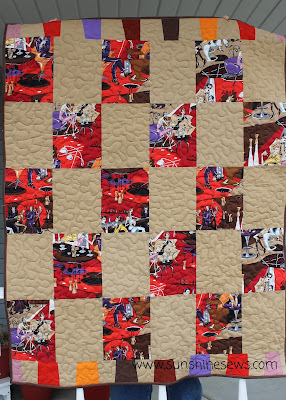 I am using a pattern called 'Days of '47' from the book, Triple-Play Scrap Quilting by Nancy Allen. There are many pieces to cut in order to complete these blocks. Our open sews last about 3 hours and during one session, I got the fabrics cut and made this one block. Phew! Seriously, it was a lot of work because of all the pieces! I am happy with how pretty this first block turned out and I am looking forward to making the next 11. I sure hope I can keep track of which piece goes where since there are so many in making this block. I also finally broke down and purchased a project case just to carry my stuff to open sew. I started out bringing everything in a tote bag since I have so many of them. The problem with that was my pieces were getting squished and wrinkled and I had to re-iron them every time I went to use them. The plastic case keeps everthing a little less wrinkly. 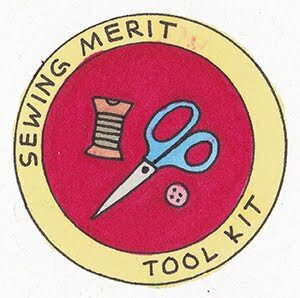 So now going to open sews are stress-free. Just me and my little project and some nice company to sew with. When I'm free-motion quilting, my kitty just loves to lie on the quilt top as I work. I think the vibration on the table top lulls him in. Once I had the top off the machine, he decided to move off the quilt. As if he knew we were done with that step. He did supervise as I prepped the fabric to cut the binding. I was so excited to get the binding on this quilt, it only took me one evening to complete it. I just love the way it looks. The colors are so modern and fresh...a definite improvement over the dank view of winter that I see when I look outside. 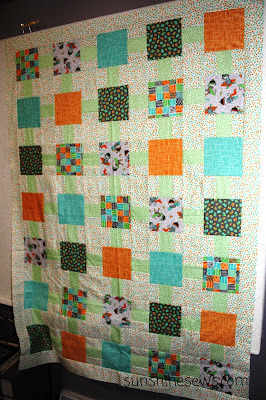 I used teal fabric on the back and orange as the binding to give it just the right balance of color. It was fun to take a Civil War reproduction pattern and make a fresh modern quilt with it. I just finished free-motion quilting this quilt for a client. Funny thing is that I have a quilt in progress using this same fabric. I have to hurry and get it done since it is for a baby shower at the end of the month and the client needs time to sew the binding on. I like this pattern and I might have to borrow it from her to make my own version. I hope when she puts the binding on, I get to see it when it's completed before it goes to it's new owner. I love the Peanuts characters and as I dug through my fabric collection to finish my sister's St. Patty's Day table runner, I realized that I had an awful lot of Irish-themed fabrics. 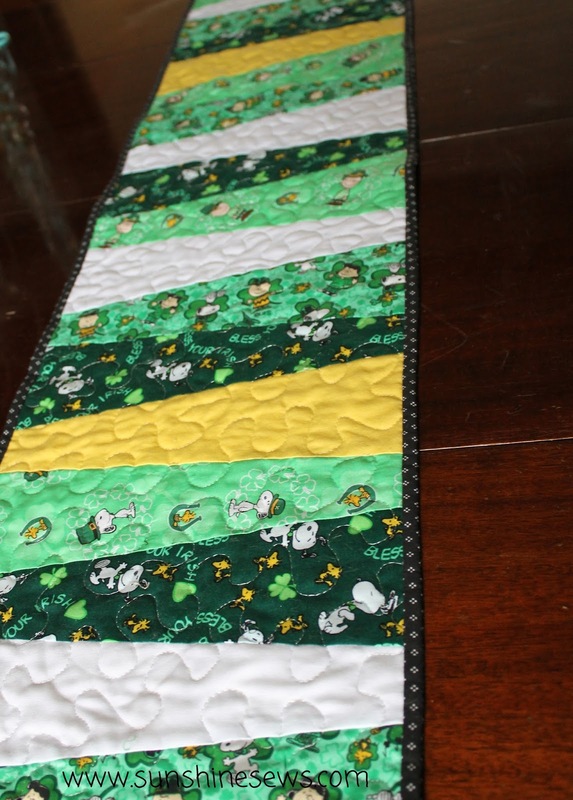 Especially Peanuts/Irish-themed fabric. Most of the cuts were one-third yard pieces so I took out one of my wedge rulers and cut a variety of fabrics. Since all the fabrics were 12 inches wide, I just took my wedge ruler and cut lined it up on the cut edges of this fabric then placed them in random order to make this quick table runner. It is perfect for my dining room table and only took a little over two hours to complete from start to finish. I love quick little projects. I used a sample collection of fabrics to make this Quilts for Kids quilt. The sample pieces come in various sizes so sometimes it's difficult to figure out how to best use all the fabric. I started by cutting the longer strips from the bigger sample pieces and worked my way down to the smaller pieces. But there's a point where I have to make certain I have enough to get a 4.5" x 4.5" square for each of the blocks. It was challenging but I managed to use up all of the sample pieces pretty efficiently. It is a very pretty fabric collection and was fun to make the pieces work. 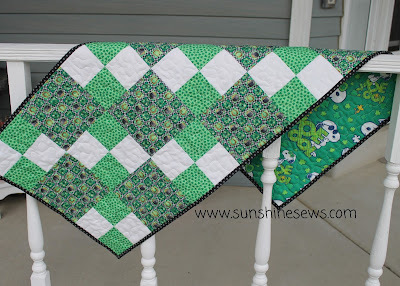 I've had this cute St. Patrick's fabric in my stash for many years. I've finally decided to do something with it. At the quilt shop, there's a class coming up for a table topper. The class uses a pattern called hopscotch which is the pattern I used in this St. Patrick's Day version. Once I completed the top, I found a cute Peanuts fabric to use for the back. It all worked together quilt well. I think this will be a nice gift for my sister. She loves everything Irish. I will have to deliver it in time for her corned beef and cabbage Sunday dinner next weekend! I made this quilt top from a charm pack last year. I never finished it because I could not figure out what I did with the fabric I bought to make the back. I purchased a few yards of fabric from the Bungle Jungle collection just for the back of this and I totally misplaced it. I looked high and low for it which was a good excuse to straighten up things in my sewing room. But tidying up did not produce the effect I wanted...the missing fabric. So I finally gave up looking for it. Of course, that's exactly when came across the MIA fabric. For some crazy reason it got tucked neatly within a totally different fabric. So I happily completed the quilt. It's one I had planned to give to Quilts for Kids a long time ago. Better late than never! I dug this strange piece of fabric out of the quilts for kids fabric bin a few months back. It has scenes from what looks like a retro version of a night club...it'a a little bit vintage in a lot of unique colors. I really wanted to fussy-cut the fabric in order to preserve the scene depicted within the fabric. 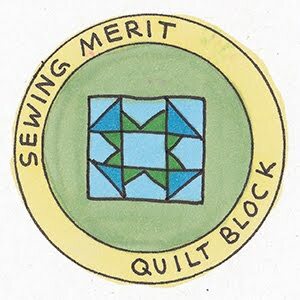 But if I did that, there wasn't really enough to make any impact within a quilt. So I just cut it into rectangles with reckless abandon. I also cut some beige/tan rectangles to put together a simple patchwork quilt top. It didn't seem long enough so I dug some matching scraps from my fabric stash and cut out some tumbler blocks and added them to the top and bottom of the quilt. It's a little strange, but I'm hoping a teenager just might think it is cool...or weird enough to want to call it their own. I am always happy to finish something that was on the design board from the last month. And I did complete the table toppers I was working on in February along with a few other things during the month. I love when things come together and get scratched of the to-do list. However there are still a few small projects left over from my new year's resolution that need to be completed but at least the big ones are all done. With that said, this is a quilt I made from a pattern called Backyard Fun that is in a book called Precut Quilts. I chose to make this because I had a fat quarter pack with 8 different fabrics in it and this pattern called for 5 fat quarters and some yardage for the background. Luckily I did have some yardage that was enough to make this quilt top. And I would have a few fat quarters left for another project. 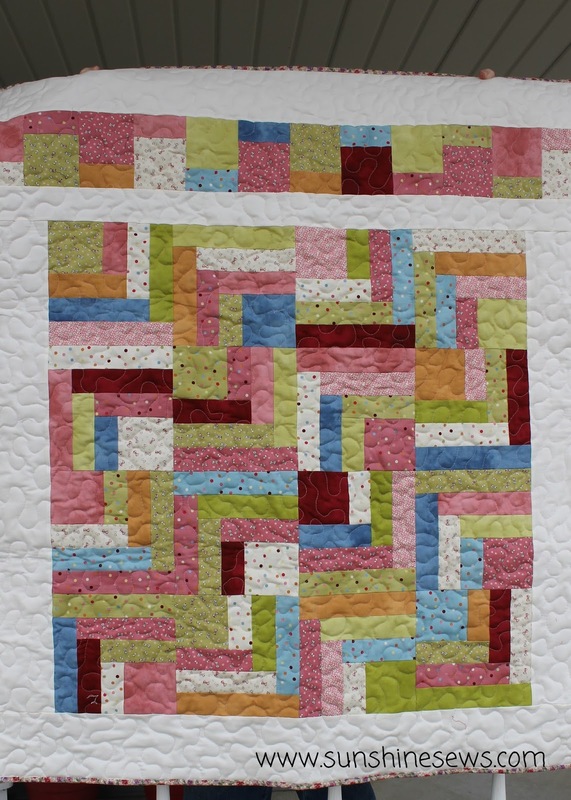 The image in the book showed a quilt top made with medium value prints for the main blocks and a darker value print for the connector blocks. My fabrics were dark value prints for the main blocks so I chose a lighter value print for the connector blocks. It totally changed the look of the quilt top. I will post more about that when I have the quilt finished. But for now, this is the project hanging on the design board. March has come in like a lion with a day where the forecast is snow all day long. 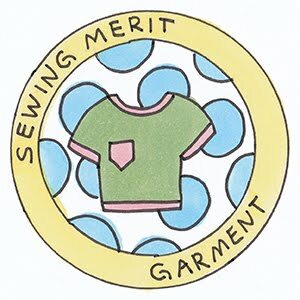 It feels like a great day to spend in the sewing studio.